The ULXD4 Digital Wireless Receiver from Shure is designed for compatibility with Shure's ULX-D wireless systems. 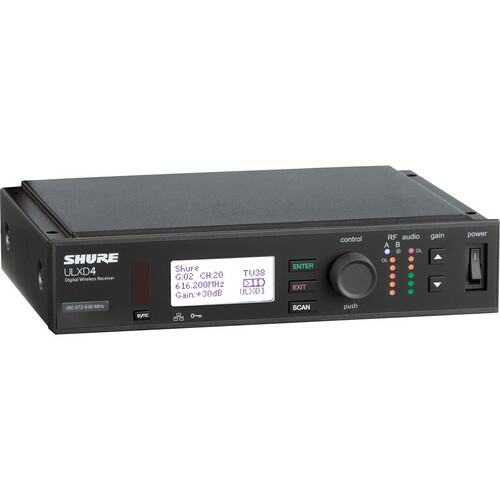 It is tuned to Shure's G50 frequency band that operates from 470 to 534 MHz. It features 256-bit AES encryption that allows for reception of secure signals. The unit's digital predictive switching diversity is designed to assure you have consistent reception. Box Dimensions (LxWxH) 18.347 x 14.567 x 3.622"
Can you only run (1) microphone through this item? Yes only one wireless ULX-D Wireless System transmitter may be paired with this receiver.